For two decades the province of Catanduanes has solely been associated with surfing – primarily at Puraran Beach in Baras. 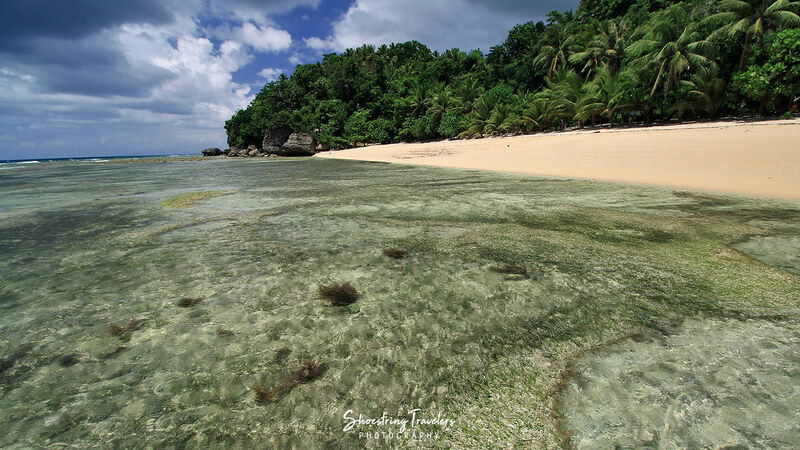 Known as the “Land of Howling Winds” due to its location that placed it directly along the path of typhoons entering the country from the Pacific, Catanduanes, however, has so much more to offer. It was only in the last 3-5 years that more of the island province’s other attractions began seeing the light of the tourism day. With much of the province hardly touched by mass tourism, we made sure Catanduanes was one of our target destinations for 2018. Three months ago we got to see a sampling of the island’s rolling hills, breathtaking cliffs, majestic coasts, golden sand beaches, rock formations and pristine waterfalls. And it was just a small sample size. The capital of Catanduanes is the first place visitors set foot upon if they fly to the province like we did. 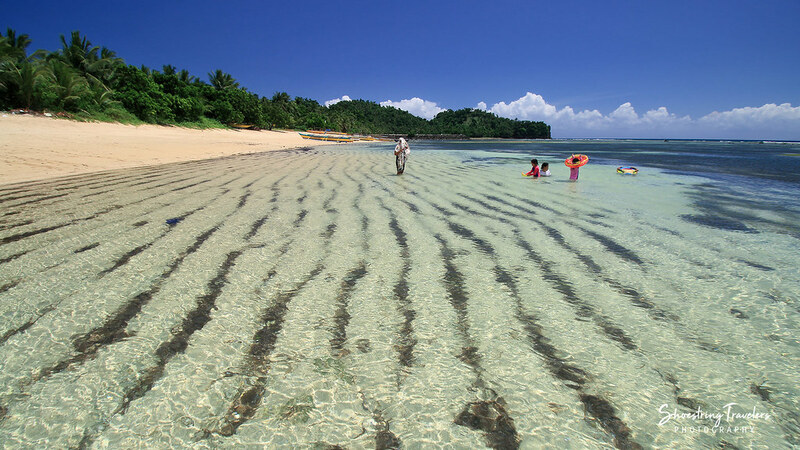 Tourists normally stay in Virac to visit its golden sand beaches many of which are lined up on the town’s southern coast. Popular stops include the Twin Rock Beach Resort at Igang Beach and Mamangal Beach in Balite. Balite Beach is in the same vicinity as Mamangal and also just along the road. Twin Rock Beach Resort is where we stayed during the entire course of our Virac trip. Marilima Beach is probably the best beach in Virac. Here, powdery soft golden sand, crystal-clear turquoise waters and coconut palms make for a dream beach destination. Near Marilima are two other beaches worth visiting: Batag White Beach and Bosdak Beach. 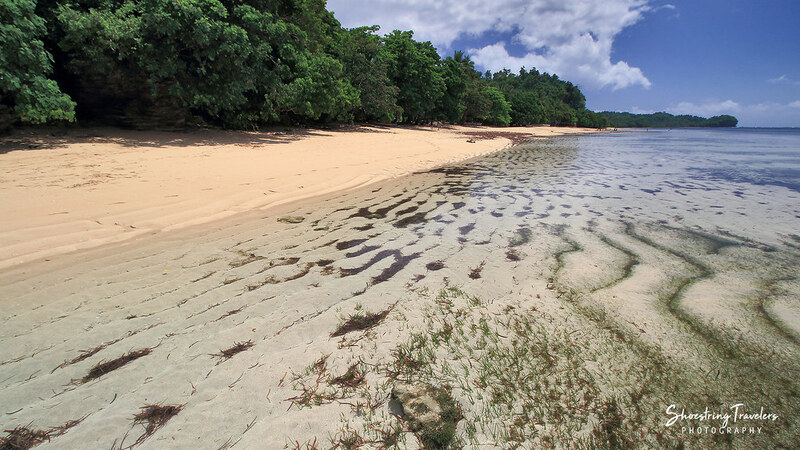 Batag Beach in particular is scenic and a favorite of ours for landscape photography. 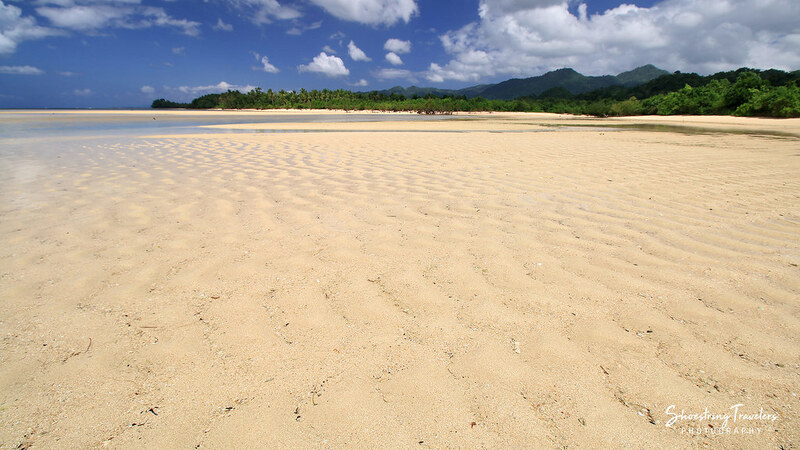 Amenia Beach with its golden sand ripples is reminiscent of Cagbalete Island and was part of our beach-hopping itinerary on our first day at Catanduanes. It’s actually located in San Andres, the town just west of Virac. Situated a short trike ride away from the town center is Hicming Falls which was supposed to be part of our first day itinerary. We never got there but on our penultimate day in Virac we visited the town center and got to try the laing pasta at the Blue Café. Located on the road from Virac to Baras, Bato has attractions that are within easy reach of the national highway. 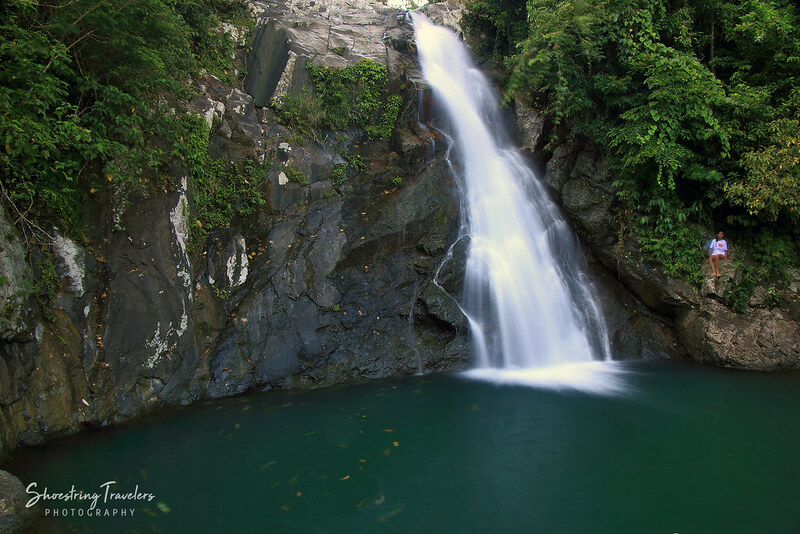 The three-tiered Maribina Falls is located just off the highway near the Bato-Virac boundary. Positioned along the highway and near the town center of Bato is the St. John the Baptist Church, known simply as Bato Church, the oldest church building in Catanduanes. Other attractions in Bato that we did not get to visit are the Bote Lighthouse and the nearby Sakahon Beach. Getting to the lighthouse requires a 30-40 minute trek through a steep trail. Off the Pacific coast is Cagraray or Patag Islet with its stunning rock formations and crystal-clear pools reachable via a boat ride (a large boat is needed to make it through the strong waves of the Pacific here). A stunning attraction though rarely visited are the 7 islands of Carorian Wonders with its white rock formations, pristine blue waters and over-all amazing landscape. 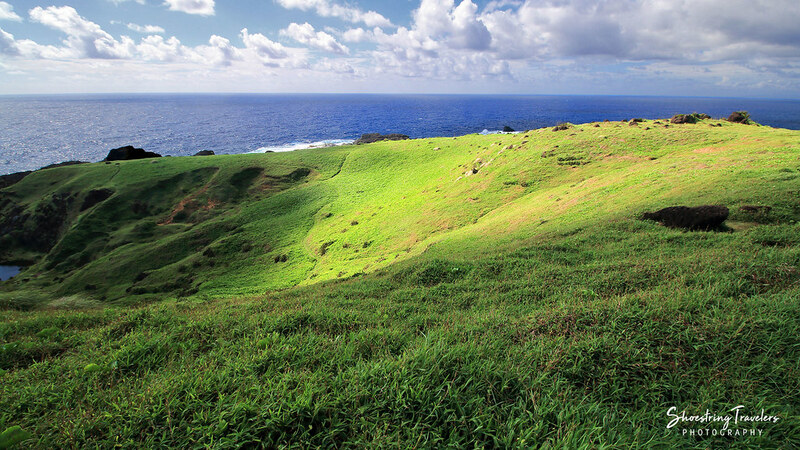 If we decide to go back to Catanduanes, these 7 islands would be a must-visit. This town got Catanduanes into the surfing map primarily because of Puraran Beach and its Majestics – the perfect barrel waves “discovered” by an Australian in the 1980s. Surfing season is from July to October. However, if you’re not into surfing, Puraran Beach is still an amazing beach destination with its golden sand, clear waters teeming with marine life and stunning rock formations. And there’s more. 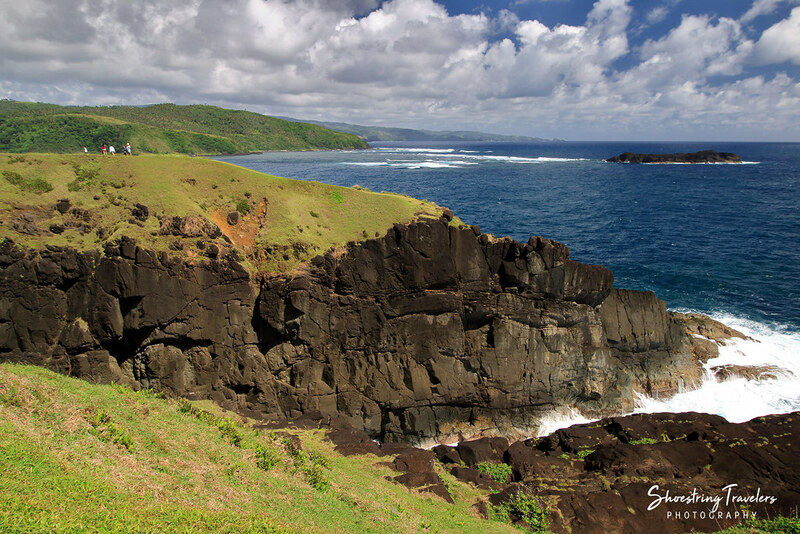 Seven kilometers away from Puraran Beach, Binurong Point is a series of jagged cliffs, undulating green hills and magnificent viewpoints from which to view the ruggedly beautiful Pacific coast. A short trek of about 20-30 minutes through a forested area is needed to get to Binurong Point. Also not too far from Puraran Beach is Balacay Point – now connected to the main road through a paved road going uphill. Though not as extensive as Binurong Point, Balacay Point provides magnificent views of the coastline of Baras including Puraran Beach. Situated on the western coast of Catanduanes and more than 80 kilometers away from Virac is the town of Caramoran. 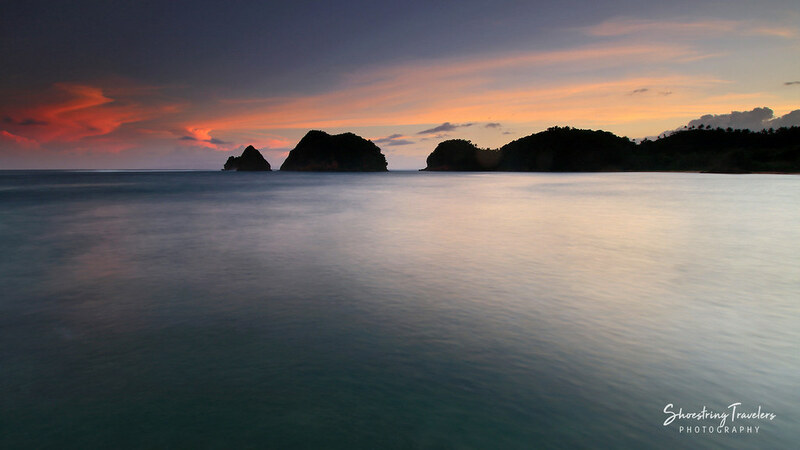 The main attraction here is the Palumbanes Islands: Parongpong, Tignob and Calabagio islands. Bitaog Beach in Parongpong is particularly stunning. The beaches in the Palumbanes Islands are almost untouched, the waters in different shades of blue are crystal-clear and the marine life offers plenty of snorkeling opportunities. One can also trek to the Parongpong Island lighthouse where you can see the nearby Calabagio Island and have magnificent views of the surrounding rolling hills and the Maqueda Channel. Just north of Caramoran is Pandan where the beautiful Cagnipa Rolling Hills and the nearby Tuwad-tuwadan natural pool are located. Situated in Pandan are more pristine beaches: the Carangyan Beach, Macailao Beach, a secluded white sand beach just adjacent to Carangyan Beach, Cagnipa Beach which sits beside the Cagnipa Rolling Hills from where it is easily viewed and Mambang Beach, another secluded beach. North of the Cagnipa Hills are the Hiyop Highlands with its view deck offering still more stunning panoramas of the Catanduanes coast. There are also waterfalls located inland including the Hinik-Hinik Falls, a 45-meter high waterfall located 25 kilometers from the town center. These three towns are probably the least explored of the municipalities in Catanduanes and, as might be expected, contain even more pristine attractions. Nahulugan Falls, for instance, is a relatively unknown beauty in the forested hills of Gigmoto, as is Dororian Falls in the same town and Paday Falls in Bagamanoc. These towns have their own share of beaches and rolling hills. Pandan has LORAN Beach (for Long Range Navigation facilities, actually an abandoned American naval base) and the Palestina Hills. Also in Pandan is Ilihan Point, more popularly known as Boto ni Kurakog, featuring a curious-looking rock formation that is sure to elicit smiles. 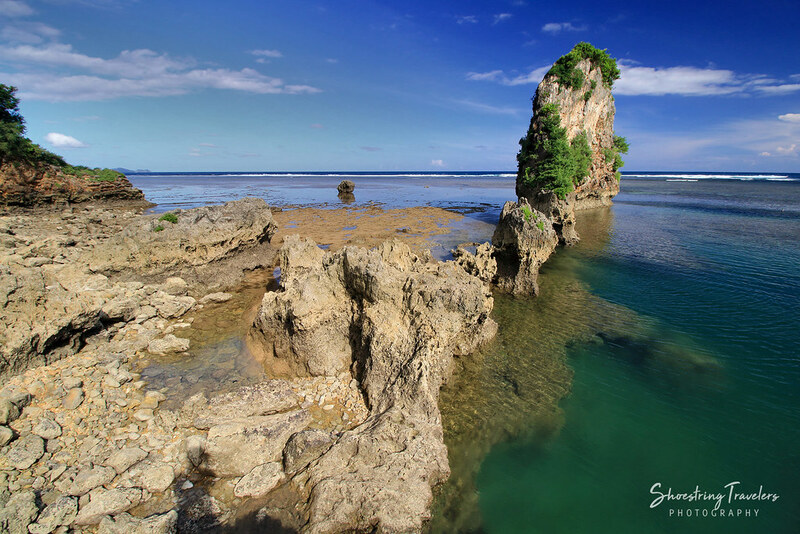 Biong Beach and the beautiful Nupa Green Lagoon and Sioron Beach are more of Gigmoto’s charming attractions. 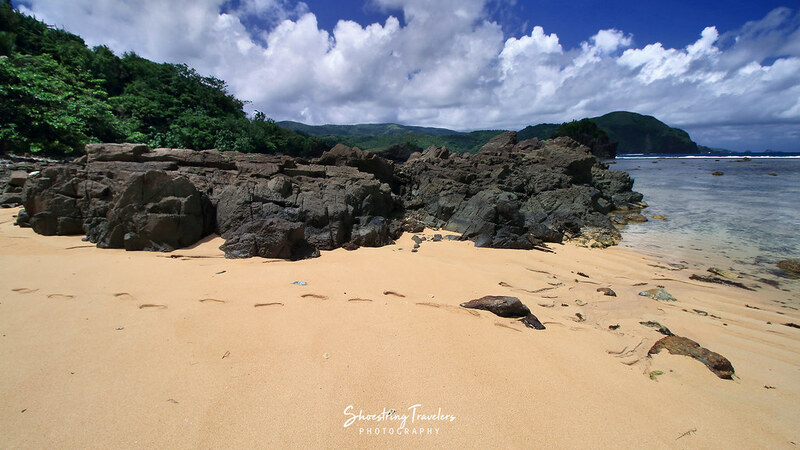 Viga has Soboc Cove with its golden sand ripples; head out to the surrounding hills and you get more of the majestic coastal views that every town in Catanduanes seems to have. Cebu Pacific flies to Virac from Manila and back every Monday, Wednesday, Friday and Sunday. An alternative to air travel is to take a bus from Cubao, Pasay or Alabang in Metro Manila to Tabaco , Albay (RSL, Philtranco or DLTB has buses bound for Tabaco). Travel time is 11-12 hours. If you miss the bus to Tabaco you may ride a bus to Legaspi, then take a van or jeepney from there to Tabaco. At Tabaco port take a ferry to Virac port. Ordinary ferries can make the trip in 4 hours; there are fast craft available that can make it in half the time. Around Catanduanes: there are jeepneys that ply the route between towns . There are also buses that can take you from Virac to the central and northern towns (Caramoran, Pandan, etc.). However, jeepneys won’t leave until full, so if you’re not willing to wait better go with a trike or take a habal-habal or motorbike. 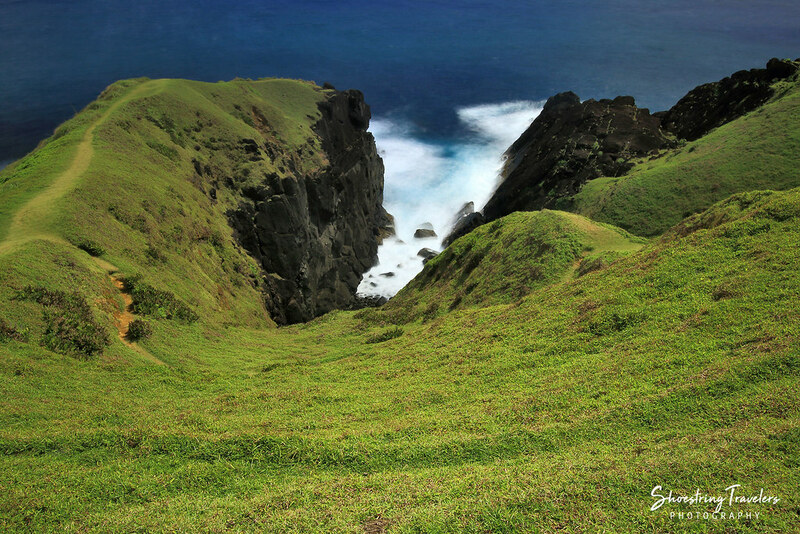 March to May are the best months to visit Catanduanes if you’re exploring its beaches, islands, rolling hills and waterfalls. During those months the waves are more manageable and the rainfall isn’t as much as at other times (Catanduanes is known to have the largest annual rainfall in the country.) Surfers prefer the months of July to October where the waves are ideal for advanced and pro surfers. Posted in Catanduanes, Travel PhilippinesTagged Baras, Bato, beaches, Catanduanes, hills, surfing, travel tips, Virac, waterfallBookmark the permalink.